Those grand vista landscapes are beautiful to behold when you run across them! The photos in this gallery are highly detailed full-resolution panoramas. It's almost like being there, especially if you go full screen and use the "SLIDESHOW" tab to the right. Spring Sunset over the Marble Mountains, California. From the slope of Mt. Shasta. 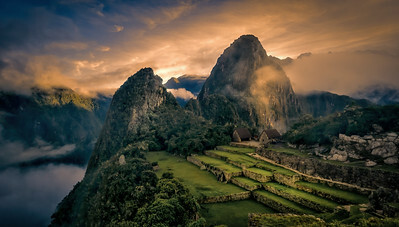 Hauyna Picchu at Machu Picchu-an adventure of it's own! M Whitney from Death Valley near the charcoal kilns. Highway 101 pullout along the southern Oregon coast.